Aside from my four boys, I also draw inspiration from the people I had the privilege of meeting because of my work. I met an extraordinary panday one rainy Friday in Malolos, Bulacan. He called his workers kapanday and they work by their kultura ng tagumpay. He is Gerardo Cabochan and he owns the Pandayan Bookshop. Pandayan Bookshop has 57 branches now and has plans of expanding its reach but not too soon though; maybe by 2015 or 2016. So much inclination to nationalism, Mr. Gerardo finished Political Science at the Ateneo de Manila University. Being the eldest son earned him the expectation to oversee and manage their family business, a supermarket. At the second floor of their supermarket in Caloocan, he thought of offering greeting cards. He also experimented on selling snacks with a little on books and magazines. That experimental selling paved the way for Mr. Gerardo to spin-off the business to a bookshop. He named his bookstore the Pandayan Bookshop with great respect to pandays or blacksmith. As blacksmiths forge metal to make a fine sword, his Pandayan Bookshop aims to shape the minds of the kabataans. He always believes that children love to read. Children long to learn. The sad reality though it that most of them do not have the money to buy books or worst, attend school. 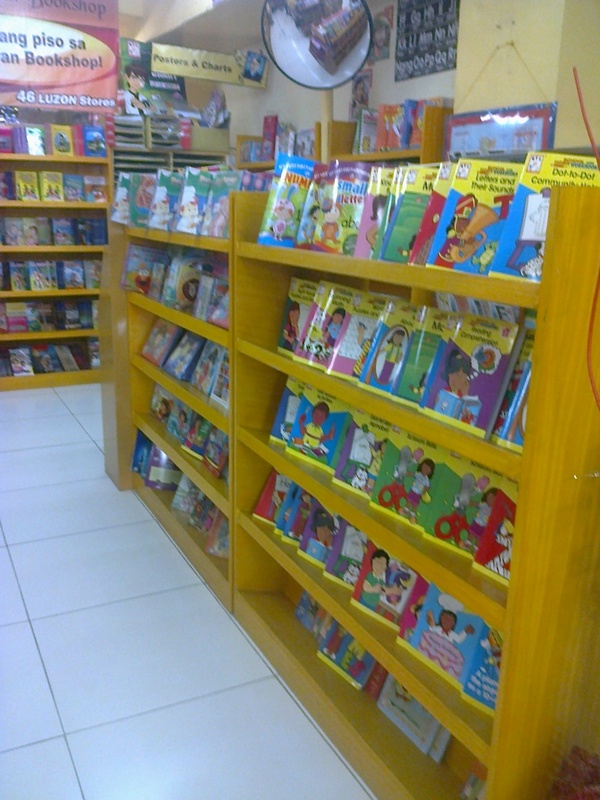 Aside from selling books and magazines, they also have a regular story-telling session for kids at the bookshop. Mr. Gerardo toured us around his shop. He relayed to us that the Pandayan Bookshop is classified into three components — the mind, the heart, and the body. The mind feeds the soul with learning. Thus, in any Pandayan Bookshop, the mind section is where the books, magazines, and other learning materials are neatly displayed. The heart of Pandayan Bookshop is where the home decors and arts and crafts are stationed. They simply fill the heart with the love for decors, arts, and crafts. 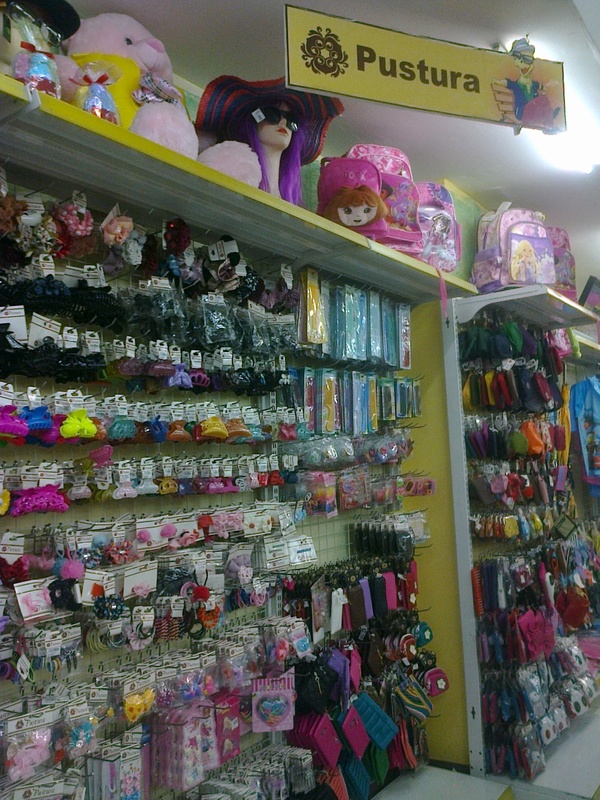 The body of the bookstore is where one buys the school and office supplies, the school bags, and even fashion accessories. About 80% of the brilliant ideas the Pandayan Bookshop adheres to came from its workforce and not from the top management as relayed by Mr. Gerardo. And all these are clearly written in their Kultura ng Tagumpay. This is because Mr. Gerardo gives his kapanday a strong sense of ownership. He gives his kapanday 20% profit sharing. And during their ulat ng lupon, heartwarming stories are overflowing. Stories like a kapanday had already built his own home, bought his own car, and sent to school his children are but a common to be heard. Mr. Gerardo values his kapwa panday very much. He would always impose that what management enjoys should likewise be enjoyed by his employees. With a very sharp eye for strategic locations, Mr. Gerardo used to travel every Wednesday. He would look for possible spaces for a new branch in plazas or commercial districts. 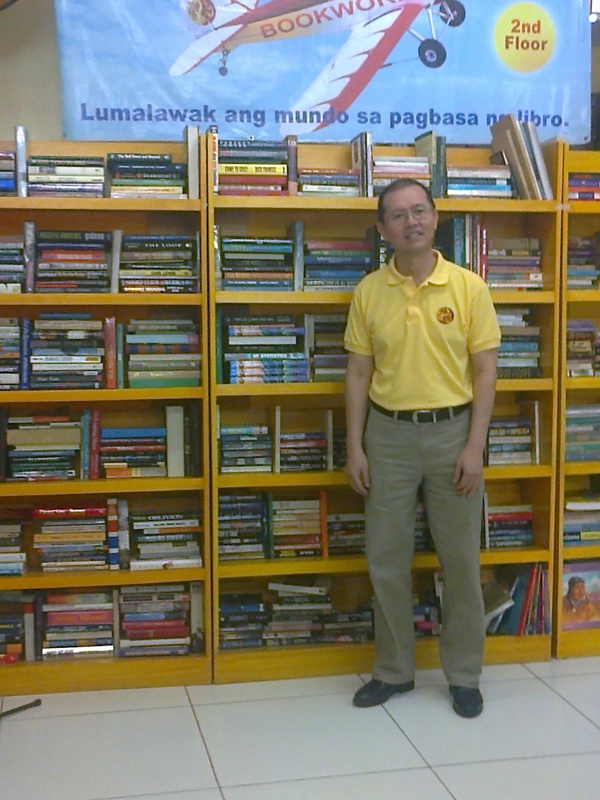 And now on its 20th year, Pandayan Bookshop has 57 branches all over regions 3 and 4 and on the outskirts of Manila. 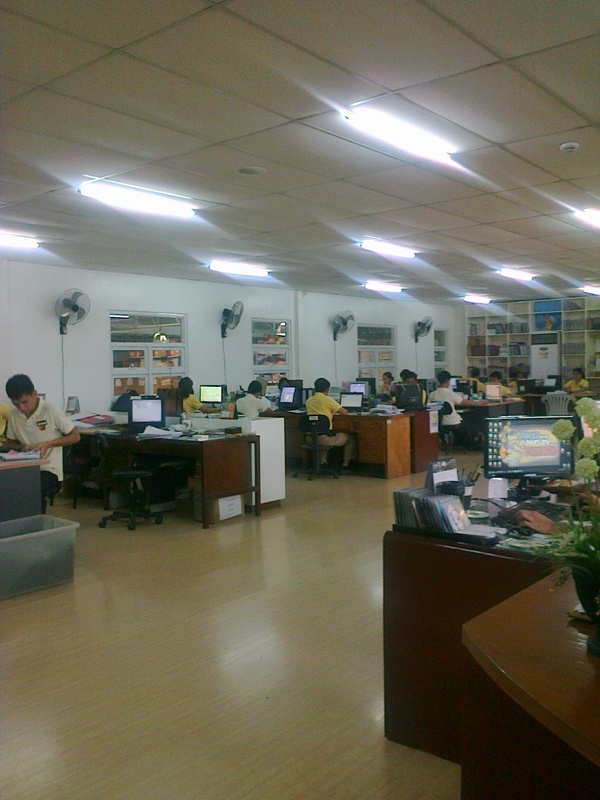 Its workforce likewise increased from mere eight staff to now close to half a thousand. Mr. Gerardo isn’t just an ordinary panday. To his employees, he is the Ama ng Panday. He wears the same uniform as the others. He treats everyone with respect and great importance. “I believe it’s human nature to us. Do something good and it will be returned to you, maybe not on the same day but on a due time,” says Mr. Gerardo. They also have a service award for their kapwa pandays. Through their pangarap para sa panday, a number of Pandayan Bookshop employees have already been to different places enjoying their trip incentive rewards. 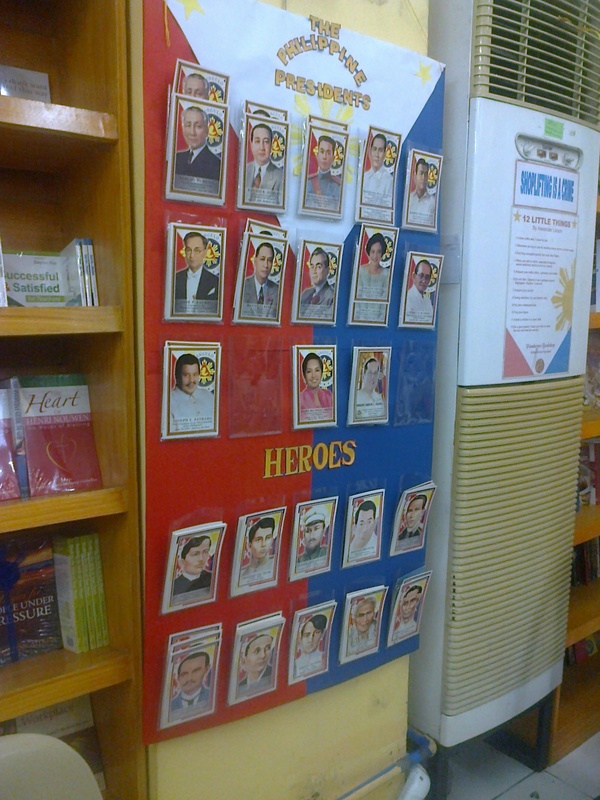 This has been what Pandayan Bookshop does to promote camaraderie and good governance. It is also their way to sustain their kapwa pandays who are their key component to success. Another significant employee incentive is granting a staff of up to 30 days paid leaves. This is if one of his family members got ill and was hospitalized. It must have been management’s kind ways that push its kapwa panday to pay it forward and do good to others too. 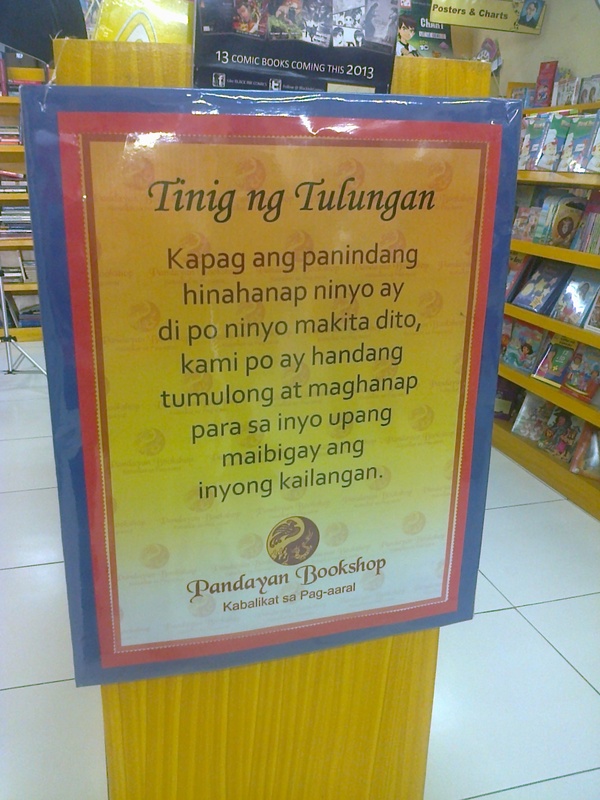 At Pandayan Bookshop, Mr. Gerardo’s kapwa panday treat their panauhin or customers with great importance. They greet their panauhin “mabuhay.” They also have a kaibigan card, a frequency discount card to extend bigger discounts to sukis. 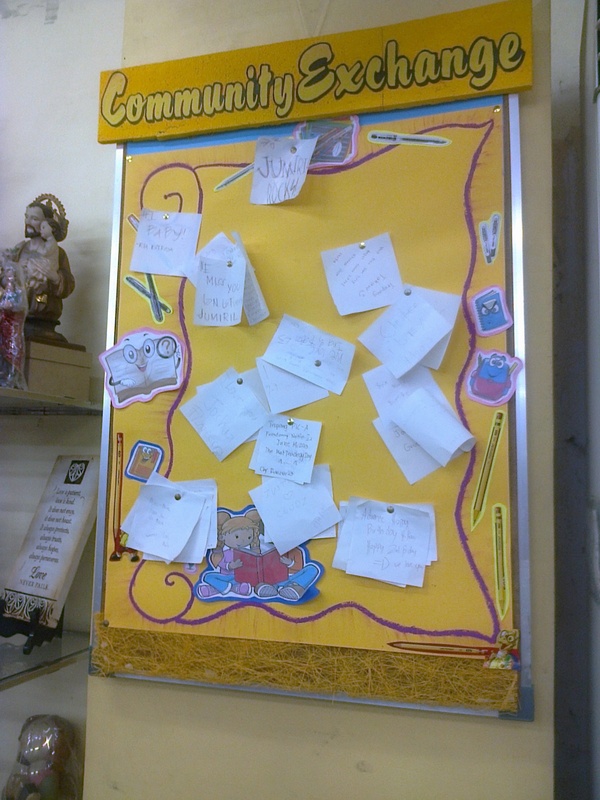 Stationed prominently within the walls of the shop are community exchange boards. This is where panauhins write their greetings or messages to friends, teachers, relatives or even special loved ones. A rather unique story I’ve heard but is a common practice at the Pandayan Bookshop is the store staff’ imbibing the company’s vision — maging pambansang tatak para sa kapwa. There was an instance wherein a student bought his school needs at the Pandayan Bookshop and only had P3.00 left. He still needed to buy three pieces of fastener. The store manager went to his office, removed his fasteners from his files, and gave them to the student. Another favorite story of the Cabochans was when a newly graduate education student needed a calculator for his board exams. Unfortunately, his money wasn’t enough to buy a new one. The staff within the Pandayan Bookshop chipped in so the customer could buy his new calculator. A Sampung Mga Daliri cooperative worker. 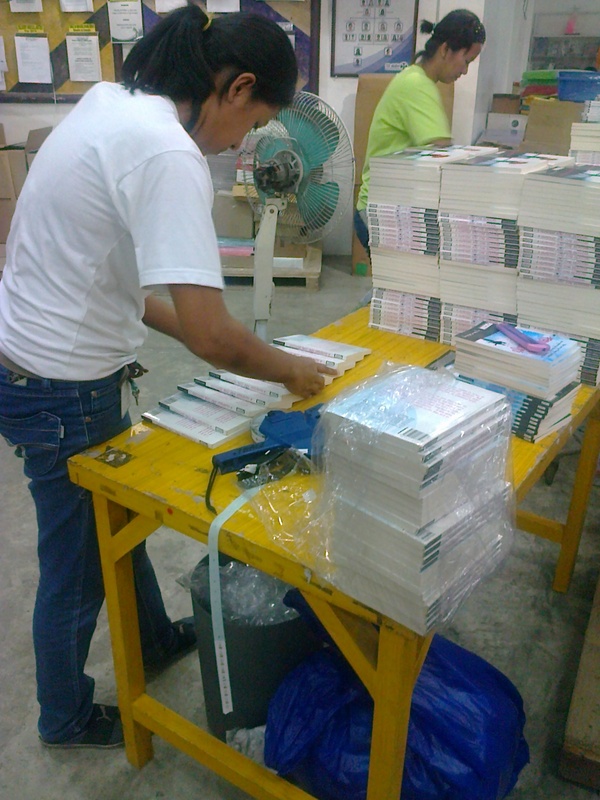 She puts price tag and plastic cover on books to free the merchandise from wear and tear during handling. The Cabochans also manage a cooperative named Sampung Mga Daliri. They employ housewives within the area to do the packaging and repacking of their goods. Through the cooperative, employees, during their birthday, could get free kaban ng bigas aside from birthday leaves. Everybody at the Pandayan bookstore is passionate about his work. And it is the same passion that still drives Mr. Gerardo to continue the business whenever he feels down and doubtful. Everybody has the same chairs and tables. 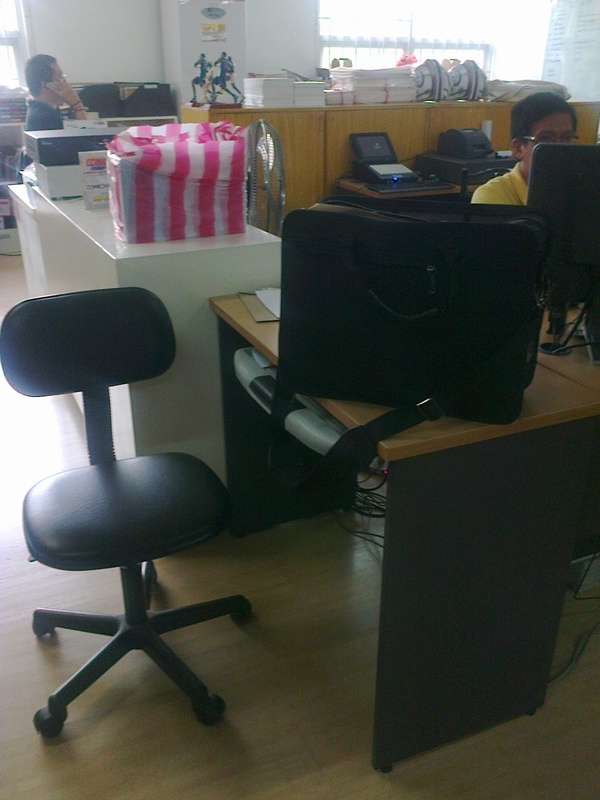 No manager’s chair or clerk’s desk. “Sometimes gloomy days are in and you somehow doubt the business. But when I look at how we are now and at the faces of our kapwa panday, I feel the urge to do more and continue. 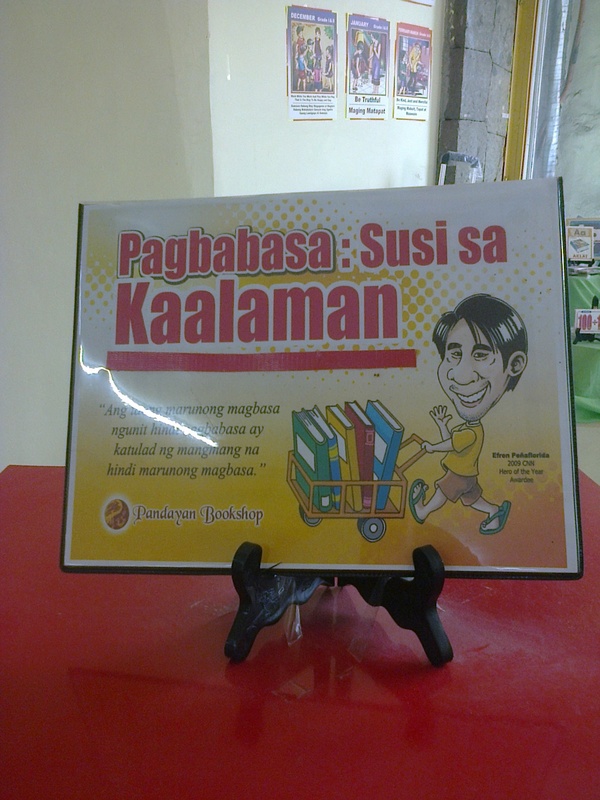 Aside from my passion for the business, it is our kapwa panday that inspire me to continue the Pandayan Bookshop. “They are as passionate as any of us,” Mr. Gerardo ends with a smile. Mr. Gerardo Cabochan is one of the most humble executives I have met. I like how he values nationalism. So impressive was his thoughts on “kapwa panday,” “ulat ng lupon,” “kultura ng tagumpay,” and “tinig ng tulungan.” I salute him on how he trained and passed the same passion and love for his kapwa panday to his son who co-runs the bookshop with him. And most importantly, I like it when he looks at us in the eyes as he relays his story to us. He always speaks of kindness and ends his talk with a sincere smile. * This interview was four years ago. I decided to publish this at Momi Berlin because the story of Mr. Gerardo and his Pandayan Bookshop is such an inspiration.